Currently viewing the category: "Amana"
If you’ve ever worked plastic with woodworking tools, you’ve probably noticed that the chips usually melt to the side of the cut, or chip welding as it’s commonly called. Not only does cleaning it up add more work, but you don’t get a nice crisp edge. I discovered that several of the blades designed to cut plastic without melting all seem to have the same features: They use a modified triple chip grind and the carbide teeth have a -2º hook angle. It turns out this is not a coincidence. Both the moderately priced A.G.E. and the inexpensive Timberline brands are also made by Amana Tool. While a dado blade is a handy tool for cutting dadoes and grooves, it takes a bit of setup to get the exact width you need. 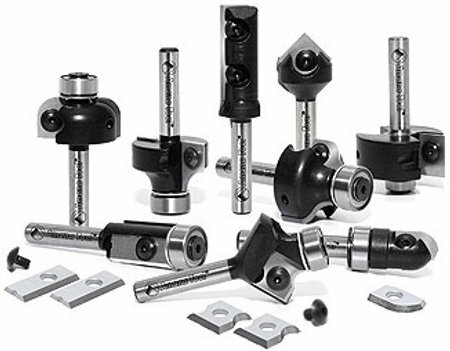 If you just want to slap in a blade and go, Amana Tool’s Carbide Tipped Groovers are for you. You’ve heard of round-over router bits, but how about round-under bits? Round-under bits allow you to form the bottom edge of a bull nose without turning the material over. Combined with the matching round-over bit, you can form a full bull nose. There are two reasons you’d want to use this bit: Either the material is too heavy and/or awkward to turn over easily, or you want to form the edge with a countertop in place. Looking for a clean way to run some wiring or piping? 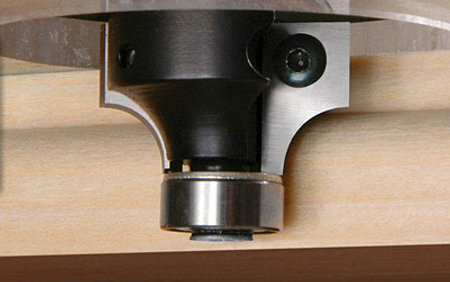 Amana Tool’s new ball end insert router bits cut a circular channel in the backside of moldings to hide the runs. Ball end bits aren’t new, but these bits are an extension of Amana’s line of bits with replaceable inserts. Rather than have a set of counter sink bits that may not be the exact size you need, you could replace them with one adjustable countersink boring bit. Amana’s Di-Count fits over drill bits sized 3/32″ to 9/32″ to drill counter sunk holes for wood screws sized #2 to #18. The 2-wing carbide-tipped bit will countersink screws up to 7/16″ deep. The countersink bit measures 1-1/4″ long and uses two screws to clamp around the pilot bit. Before shipping charges take a bite out of your wallet, you’ll pay about $23 for the Di-Count adjustable countersink boring bit. We’ve covered a carbide scorer/cutter before, but the Striker Utility Score was a folding multi-tool. If you cut a lot of laminate flooring, Formica, plastics, Plexiglas, or other material that has to be scored to cut, you probably want a dedicated tool like Amana’s Dicut. Amana manufactures the Dicut from lightweight steel precision and coats the handle with plastic. They precision-grind both carbide edges, which can be resharpened if necessary. Pricing for Amana’s Dicut Laminate Cutter starts around $12. You don’t want to be out of commission waiting for your dull router bits to be sharpened. That’s why Amana Tool’s created the new In-Tech series insert router bits. They never need to be sharpened because you just replace the cutter when the old one dulls. Amana manufacturers the knives for the In-Tech bits out of tungsten carbide, so you can use the bits on a wide variety of materials like softwoods, hardwoods, MDF, and chipboard. They claim the bits (not the cutters, of course) last four times as long as other brazed router bits, and the cutting accuracy is consistent over the life of the knife. 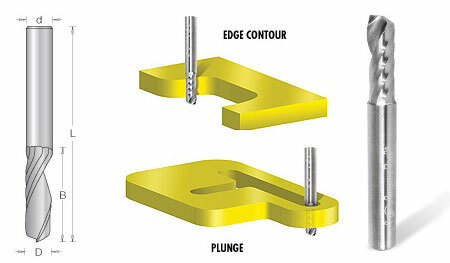 Amana makes nine 1/4″ shank bits with replaceable cutters. The nine bits include a 1/4″ radius bit, a 1/4″ cove bit, an Ogee bit, a 1/2″ rabbet bit, a flush trimming bit, a 2-in-1 corner round and bevel trimming bit, a V-groove bit, a 1/4″ radius core box bit, and a 1/2″ straight plunge bit. Amana priced the bits comparably to other companies’ brazed router bits. The bits cost anywhere from $17 to $53 and replacement cutters run $6 to $15 in pairs. How do you make tambour doors — you know, the rolling doors in roll-top desks and appliance garages? You could glue the slats to a cloth backing, then fish a wire through every slat to hold the tambour door together, or you could use Amana’s new bit set. 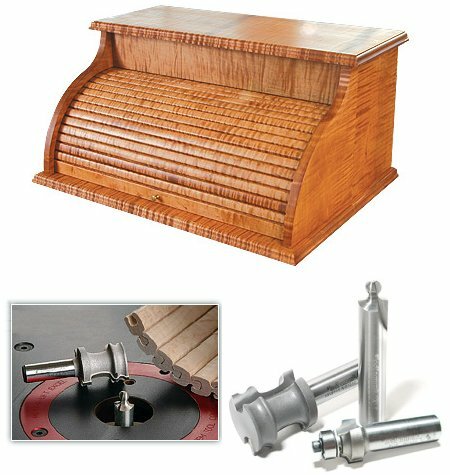 With Lonnie Bird’s three carbide-tipped tambour/appliance garage door bits, you can create uniquely shaped slats that interlock. Channel cutting thick plastic normally either turns out looking less than perfect with a standard router bit — or is just impossible. 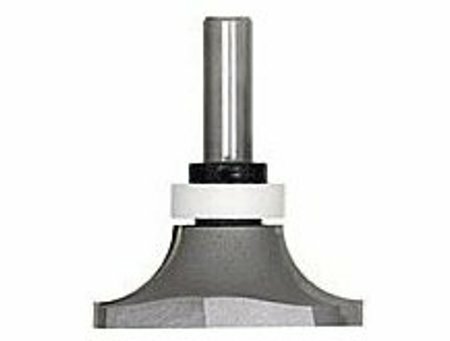 But Amana has a plastic router bit designed to cut, shape, and de-burr plastic all in one pass. The secret to good looking plastic cuts is fluted spiral cut of the bit.